Uncover the history and opulence of historic New Orleans during this 2-hour through the Garden District. 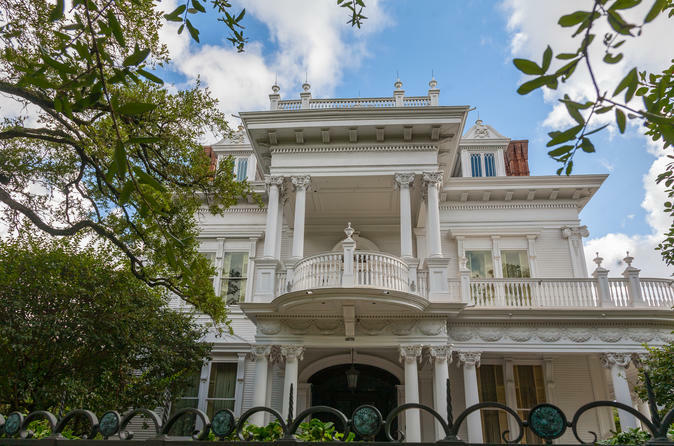 Visit Magazine Street, wander through The Buckner Mansion, the setting for Miss Robichaux's Academy in American Horror Story: Coven, and check out the homes of well-known celebrities. Take a trip to The Rink with an expert guide before heading to Lafayette Cemetery. The adventure starts on famous Magazine Street, known for its amazing shopping and dining options. Your friendly and knowledgeable guide will start the tour outside of a great place for a pre-tour snack (at own expense). Learn about the history of the Louisiana Purchase and how it effected the area. The first stop of the day will be on First Street, to the address where Jefferson Davis died. Civil War history is delivered through the lens of the Garden District. Then, continue on to the Brevard-Rice Mansion, the former home of well-known author Anne Rice. Next up is the picturesque Buckner mansion and the former home of Peyton and Eli Manning. Continue wandering to the Opera Guild House, Colonel Short’s Villa, the fictional Benjamin Button’s house and the home of actress Sandra Bullock. Upon arriving at The Rink, take a break and relax with a frozen lemonade or iced coffee (at own expense). Restrooms are available here, and there is also a popular bookstore and gift shop that’s great for browsing. After resting up for a bit, continue on with a visit to the famous Lafayette Cemetery Number 1 at tour's end. There will be a streetcar nearby as well as miles of shopping and dining.